By the early 1900s when reparations were being paid by the government to Cherokee descendants, the word Cherokee became ubiquitous with Native, especially in descendants in the eastern US who had Native ancestry, but didn’t necessarily know which tribe. In fact, in many cases, mine included, the Native ancestry had been played down, if not outright hidden, due to discrimination and the fact that Native people were considered to be “of color” and therefore forbidden many civil rights. Therefore, Cherokee became synonymous with “Indian” and many people claim Cherokee ancestry from areas where there were no Cherokee tribes or villages. This doesn’t mean these people didn’t have Native ancestry, but it very likely was not Cherokee. The following testimony taken in Marion, Indiana on August 13, 1908 is a good example. 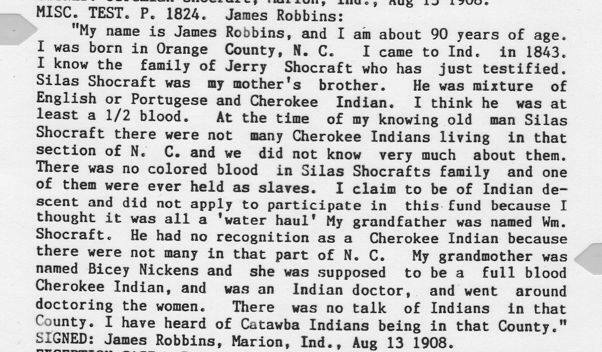 Robbins testimony contributed by James Nickens. This entry was posted in Cherokee, History. Bookmark the permalink. All of my life my Grandmother (now deceased) told me that her Father’s Grandmother was a Cherokee Indian. My Grandmother was an illegitimate child and I never knew her father’s name so, I can’t follow up on her heritage by any other means than DNA. She was born in Franklin, NC near the Cherokee reservation so, the tribe would be Cherokee. We are not interested in any reparations, we are just interested in finding out if we are of Cherokee heritage. I have always had a heart for the Indian people and the Irish. I was born in North GA and I’m sure that I have Irish, but not sure on the American Indian. My question is, could a DNA test at least determine if I’m a descendent of Cherokee heritage? Thank you in advance for your help. Here are two articles that may help you. The Indians in this area would have been Siouan like the Catawba he mentions. A lot of people confuse Catawba with Cherokee, possibly because they lived together for a while a hundred years ago.